In the 70's my mother had this big, beautiful burnt-orange stock pot. It was the only colored pot she had; the Lone Ranger among the boring stainless steel. I loved when she brought it out, as I knew something good was going to come out of it; usually one of her uber-healthy soups or a slow cooked pork roast. I later learned the name of that magical pot: Le Creuset. 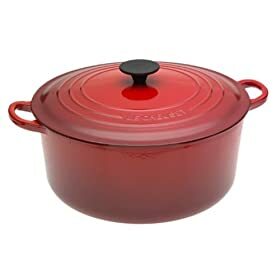 The French cookware company is best known for its colorful "French" ovens (aka Dutch oven. But, shhh, don't call it that in France. It's a pride thing). It's now the cookware of choice in my own kitchen. Made of enameled cast iron, it has excellent heat distribution and retention, is easy to clean (bonus! ), and looks oh so lovely on your stove (and in your oven too). Enamored with all the Le Creuset colors, my collection is quite eclectic; red, green, even the modern version of my mom's burnt-orange one. I just wish my broccoli soup tasted as good as hers. I'd love to know what you think. Click the Comments link below and share your thoughts.